Varying conditions indeed. It’s one thing if your flight is late due to weather or mechanical problems or whatnot. But if your flight makes it to your destination but your bags don’t? What’s the excuse other than airline incompetence? And why should I pay $25 a bag for that? Feel free to take this kvetching with a grain of salt. I’m annoyed because Delta Airlines managed to trash yet another piece of my luggage yesterday. Considering that Marian and I don’t travel more than a few times a year, it’s remarkable how quickly our luggage falls apart these days. 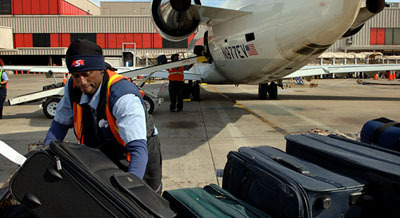 Is it crappy luggage or is it airline abuse? I guess I’ll never be able to prove it one way or the other, will I?